Ever since social sciences in general and Social Studies of Science and Technology in particular engaged on the topic of the Anthropocene, old debates regained life. If the Anthropocene calls for a jointed scientific effort, truly interdisciplinary (or “transdisciplinary” as Anna Tsing puts it), how should social science approach natural sciences? Can the Anthropocene finally break through the thick walls which still keep social and natural sciences very disjointed in the universities and societies? I don’t intend to answer such questions but, instead, to challenge the idea that the Anthropocene is the ultimate tool for breaking the semiotic and material barriers between social and natural sciences and, moreover, science and politics. Targeting that topic, I’m bringing a metaphor to think-with Hermit-crabs and the symbiotical relation they create with mollusks for better chances of surviving in the wild. I’m well aware that my argument may sound pretty generalist on these terms, so, for the purpose of registering which works inspired this essay, I’m dialoguing with: two articles by Bruno Latour in which he openly defends the use of the concept of Anthropocene; some papers and interviews with Anna Tsing and her fellows at AURA (Aarhus University Research on the Anthropocene); and the latest book published by Donna Haraway, “Staying with the Trouble”. As the latter goes by as an inspiration for the argument, the former are representing the kind of approach I’ve been skeptical to. Furthermore, I’ll use papers and interviews with Nobel-prize winner Paul Crutzen. Largely pointed out as the responsible for the recent popularity of the debate, Crutzen is probably the main common reference used by social e natural scientists and an ideal partner for a comparative work. This essay aims to be no more than a short text about the concerns and risks of embracing the Anthropocene as a tool for “transdiciplinarity”. And while one can spotlight that the division between social and natural scientists may be outdated, the comparison is still a valuable strategy. Even more if the topic is a concept which has been claimed capable of disrupting that division for good. The conversation with the authors cited above aims to suggest that the Anthropocene used as a tool is not the interdisciplinary panacea some social scientists would like it to be. In my point of view, it calls for a very specific relation between social and nature sciences, which is very much alike the one hermit-crabs make with mollusks: a single-handed job, barely noted by the other, in which the main task tends to be surviving in an environment extremely hostile for those with soft bodies – or sciences. Hermit-crabs are not a species; there are actually almost a thousand of them, all of which belongs to the superfamily Paguroidea. All those Paguroidea species share a common behavior: they build relations of commensalism with other species. Commensalism is an inter-species relation in which one can get benefits such as food or transportation from another without causing harm or giving any benefits back. A much remembered case of commensalism is the one that put together shark-suckers and sharks. Shark-suckers can grab on sharks bodies as a way of transportation and also for eating what is left of a shark’s meal. The sharks are not harmed by this interaction, but they also don’t take any benefits of it. While this is a very didactic example for understanding commensalism, it does not designate all its types. A particular case of commensalism called metabiosis is the type hermit-crabs make with mollusks. On metabiosis relations, one species is dependent on another for surviving in a hostile environment. The Paguroidea have a limited exoskeleton, which covers only the front part of their bodies. The remaining parts are partially composed by a soft abdomen, extremely exposable for predation. For this reason, hermit-crabs search and fight for mollusks shells in which they can both live in and protect the soft part of their bodies. The shells can be carried around by hermit-crabs as long as it still works as a house or until the hermit-crab finds a better one. 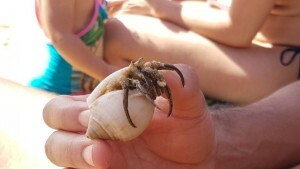 The search for a shell affects heavily on the behavior and social life of hermit-crabs, as it is not unusual that the number of hermit-crabs exceeds the number of shells in a certain site. Unlike the shark-suckers, hermit-crabs don’t need live mollusks to create a commensalism relation; it is the other way around. They use the shells abandoned by the mollusks or the shells left by the dead ones. 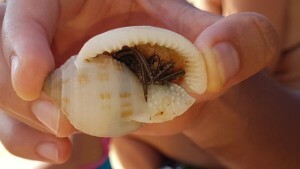 Although the use of shells by hermit-crabs don’t affect mollusks in any ways, it is fundamental for Paguroidea crustaceans to survive. Hermit-crabs are completely dependent on mollusks shells, so even if mollusks are not actively helping hermit-crabs, they offer the kind of hardness hermit-crabs lack and need. The relation between hard and soft gains new meanings in an ecosystem where hardness is a condition for existence. Donna Haraway is one of the theorists which are not quite convinced about the narratives of the Anthropocene. In her latest book, “Staying with the Trouble”, Haraway (2016) points out that the Anthropocene is taken as an epoch, like the Nobel-winning scientist Paul Crutzen suggest, but also as story and as a tool. It is a cosmological tale that strengthens a scientific and anthropocentrical point of view and counts on a fatalist end for the Earth. Even though some well-known social scientists, such as Bruno Latour and Anna Tsing, share some of the concerns pointed out by Donna Haraway, they are also very engaged with the third form of narrative of the Anthropocene: take it as tool. A tool for what exactly? What are they trying to build? These are key questions. Before I answer these questions it is important to state that this topic has been as popular as it is controversial. Many natural scientists are still not convinced that it is already time to let the Holocene go. Even between those geoscientists who agree it is time to highlight human presence in a geologic epoch, there is no consensus on when it has started, which is an important point as it can associate the Anthropocene with great history events like the emerging of capitalist economics, colonialism and the industrial revolution (Swanson, 2016). Among social scientists the matter is, perhaps, even more controversial. The perception of the “great human impact on Earth” made, for instance, Donna Haraway suggest the term Capitalocene in a recent past, and some other terms in the present, such as Plantationcene and Chthulucene – both good names for expressing irony and criticism to the idea of Anthropocene and the ways it seems to marvel some social scientists. Above all, Haraway denounces that a concept that highlights the “anthropos” is arrogant and dangerously outdated as it fails to recognize that any world is built by very complex inter-species relations, never by a species alone. It is only fair to say that social scientists, indigenous people and other sources of knowledge have been talking about the themes the Anthropocene brings as novel for a long time, way before it has come to the attention of nature scientists like Paul Crutzen. Although these controversies and denunciations are well-known by the AURA researchers (they talk about both the events I just mentioned in a jointed essay (TSING et al, 2015), they still claim there are good uses for the Anthropocene as a concept or a Science Fiction (TSING et al, 2015). As Latour would put the matter, “in spite of its pitfalls (Bonneuil and Fressoz 2013), the concept of Anthropocene offers a powerful way, if used wisely, to avoid the danger of naturalization” (LATOUR, 2015, p. 2). What are we able to build with the concept of Anthropocene (if used wisely, as Latour suggest)? That is the main question for those social scientists willing to use the Anthropocene as a tool. But why a tool? Are there differences in taking the Anthropocene as tool and not as an epoch or a story? AURA researches represented by Anna Tsing, Nils Bubandt and Heather Swanson had already shown they are very familiar with the critics and problems commonly addressed to the concept (TSING et al, 2015; SWANSON, 2016; BUBANDT et al, 2015). They, in the same way as Latour (2015; 2017), recognize there are risks on its use and choose to embrace those risks. Latour (2015) says that moving from science versus politics to sciences with politics is impossible without risks. If these researchers are well-aware of the criticism and admit the concept involves high risks, it starts to get a little clearer why they take the Anthropocene as a tool. They have no commitment with seeing it as a big and final epoch – the AURA researchers do not see a problem in treating it as Science Fiction (TSING et al, 2015). So the question becomes not what is the final and true Anthropocene, or not even when it started, but what can be done with this popular and controversial concept. Tsing et al (2015) show that there are many ways to conceptualize the word and that they differ a lot. It is the diversity of Anthropocenes that makes it interesting as a concept which is “Less Than One But More Than Many” (p.150). Indeed, the Anthropocene concept might be seen an antidote of sorts for the “Science Wars”. In contrast to the epistemological battles of the 1990s, the Anthropocene concept urges geoscientists, archeologists, ecologists, historians, and social scientists to take each other’s work seriously—because the projects it inspires require that they do so. Nils Bubandt, also a fellow at AURA, says that “At the same time, it might still be utilized to do useful work, to galvanize already emergent forms of thinking and acting in academia. For instance, one could claim that it disrupts the global hierarchy of sciences” (BUBANDT et al, 2015, p. 548). These two quotes may show what is to take Anthropocene as a tool. AURA researchers believe it is a concept that makes collaborative research possible, and that not only breaks the separation between science and politics, but also does the magic trick of disrupting the ‘global hierarchy of sciences’. It is a path that will lead us all to the transdiciplinarity. Anna Tsing sees transdiciplinarity with Anthropocene, and explains it by saying that she would put each discipline as a genre: same way you can write a Mystery Science Fiction by putting together a Mystery novel and a Sci-Fi tale, the Science Fiction of Anthropocene can make the many genres work together (BUBANDT et al, 2015). It seems to me that for Latour and AURA the better way of using the advantages of Athropocene concept is to create an open ontological dispute. To fight for the meaning of Anthropocene would avoid what Latour calls naturalization and the problems with the Anthropos at once. Even when they all recognize it may be a return to the modernist point of view on science, or some kind of positivist knowledge social scientists have been fighting against for so long, they have an answer: Latour (2015) says that “Of course, there exist plenty of reasons for imitating what feminists call “strategic essentialism” and to employ, whenever necessary, a form of “strategic positivism”’ (p. 7). Once observed that this quote came from Bruno Latour, one might ask what makes the Anthropocene a shift so different from what Latourian Actor-Network theory has been saying and doing for the last decades. Strategic positivism? Politics and Science merging? Interdisciplinary research? A world made of hybrids? So, it seems like all these things are novel only for nature scientists and, perhaps, for some social scientists who had been sleeping in cryogen for at least the last three decades. Bottom-line: sometimes the approach towards the great gains of Anthropocene sounds like a promotion of Actor-Network Theory for nature scientists, as if Latour was inviting nature scientists to do something he has been doing himself for a while. This idea is reinforced in another article. Latour (2017) suggests that the problems with the “anthropos” in Anthropocene are no different from the problems with the “anthropos” in the beginning of Anthropology. One can assume he is saying that Anthropocene as a new field will find its way, like Anthropology eventually did. So all of a sudden, it seems to be ok to ignore more than a century of anthropological researches and contributions in the name of a great plan of “strategic positivism”. Is all that true? Can Anthropocene have such power to break hierarchies among sciences? Is Anthropocene a time and space when nature scientists acknowledge politics cannot be separated from science and, hence, that they were wrong this whole time? Is the solution for interdisciplinary and collaborative thinking we have been praising for so long resting on western, anthropocentrical and positivist tales? The way I see the matter, this beautiful scenario painted for the Anthropocene is indeed a Science Fiction one. But a very utopic SF. Of course, it is a dystopia if you’re counting with the end of the world. But if the Anthropocene is this new field and a SF where transdisciplinarity meets the end of the hierarchies of sciences, then it is indeed very utopic. It would be truly amazing to see Nobel-prize winners calling out humanities and social-sciences for building jointed knowledge. Any concept able to do that should be praised. Unfortunately, I don’t think that’s the case with Anthropocene. Before ending this very session, I would like to bring up the same question Donna Haraway made in a collective interview which included two AURA’s fellows, and add another. If the Anthropocene as a concept itself breaks the divisions between science and politics, why would the concept of Capitalocene be ignored on the accusation of being ideological (BUBANDT et al, 2015)? And I add: What kind of symmetry the Anthropos is able to build? Many articles written by AURA fellows point out two names when it comes to decide who coined the term Anthropocene. One is Eugene F. Stoermer, who used it in the 1980’s, and the other is Paul Crutzen, the Nobel-prize winner who is credited for making the concept popular as a geological epoch (SWANSON, 2016; BUBANDT et al, 2015; TSING et al, 2015). They wrote together a paper commonly remembered as the first stand on the recent popularity of the term (CRUTZEN; STOERMER, 2000). Stoermer is no longer alive, and Crutzen writes with the scientific authority of a Nobel-prize winner. So, although it might sound generalist (and maybe it is indeed. You can call it a strategic generalism), I consider here papers and interviews with Paul Crutzen, willing to show the kind of approach nature scientists have been giving to the Anthropocene. My intention is to highlight how it differs from the Anthropocene as a tool, and also why I called the use of it as a tool “a very utopic SF”. The kind of interdisciplinarity Paul Crutzen wishes to achieve with the Anthropocene does not include social sciences or humanities. Also, it seems to me very wrong to assume that his approach supports the idea of hybridization between science and politics. Even though I am well aware that Crutzen’s point of view cannot be taken as nature sciences as a whole, I tend to think that analyzing his papers and words has a particular importance. He is called by the Environmental & Society portal “Mister Anthropocene” and is probably the only nature scientist which is a common reference in all works written or co-written by AURA fellows I cited before. Also, his Nobel credentials and his position as the co-creator of the term both make his opinions have big importance among the scientific community and the public in general. Crutzen is very vocal about how the Anthropocene is not a matter for one science, but for plenty of them. He mentions the necessity of interdisciplinarity in many articles, such as Crutzen et al (2007); Crutzen (2002) and Crutzen et al (2010). Some quotes from these articles may show, however, that he calls out for a very limited interdisciplinarity: “The Anthropocene Working Group hence, uniquely, needs to include botanists, zoologists, atmospheric, and ocean (and other) scientists as well as geologists” (CRUTZEN et al, 2010, p. 2230). In another paper he says “A daunting task lies ahead for scientists and engineers to guide society towards environmentally sustainable management during the era of the Anthropocene. This will require appropriate human behavior at all scales, and may well involve internationally accepted, large-scale geo-engineering projects, for instance to ‘optimize’ climate” (CRUTZEN et al, 2002, p. 23). I was not aware of that criticism. […] However, what humankind has achieved during such a geologically very short period is so unique that it deserves a special place in any discussion like this. We humans only have our human brains and through them we understand the world. So even when you take into account the perspectives of other species, you are using a human brain. The situation would be totally different if there was another species on Earth that could say “I.” (CRUTZEN, 2013, np). First, this quote shows he was not aware of one of the most recurrent criticism made by social scientists about the Anthropocene. Then, it shows very well what are his views on the Anthropos, which have nothing to do with the “distance to Man” Tsing said the Antropocene could bring (BUBANDT et al, 2015). He is talking about this unique, modernist and only intelligent creature on Earth: The Man. Despite the effort Latour (2017) made in giving a response to the “anthropocentrical problem” with the Anthropocene, such ideas about intelligence proves that the risks are incredibly high. Which stories are we making alive again? Is it worth the fight? Can AURA’s researchers or Latour be heard like Crutzen by the scientific community, public and politicians? But that’s not even the most important part. Reading Crutzen works makes pretty clear to me that there is an abysm between the Anthropocene Science Fiction which is currently being made by AURA and the one made by nature scientists like him. With that in mind, fighting for a more favorable meaning of Anthropocene seems to be a lost war. In the same group interview edited by Nils Bubandt I mentioned before, Anna Tsing says, in a moment of pure honesty, that in the United States she can barely have lunch with a natural scientist in a serious way (BUBANDT et al, 2015). This moment is very representative for my argument. If a very prominent and worldly known anthropologist like Anna Tsing faces this kind of difficulty when trying to get with nature scientists, it becomes clear how hard it is to achieve the promises of the Anthropocene as a tool. Even though a group of researchers from different disciplines like AURA (nature sciences represented by bioscientists) sure strengthens the possibilities of collaboration, to imagine that the Anthropocene itself will disestablish hierarchies of science like Bubandt suggested in the same interview sounds like expectations are as great as naïve. The potential gift of the Anthropocene is its push radically to rethink the ‘anthropos’ that is the object of the discipline and thereby to force anthropology to become relevant, in a novel and crucial way, to understanding a world faced with unprecedented human-induced environmental disaster (BUBANDT et al, 2015, p. 536). In the name of this geological-epoch (life is not enough) time opportunity of being taken seriously by nature scientists, here we are, playing with their concepts; emulating their hardness in an Anthropos body we thought we were over with. Are anthropologists the ones in need of radically rethinking the Anthropos? I honestly thought this was what we have been doing ever since the beginning of the 20th century. Of course, this is not something important only on an “ontology” level. This essay by no means aims to deny the very obvious impact of human activities and capitalism on the planet. The question here is much more why we are willing to call this impact Anthropocene. Please tell me that you share my anger, that in this moment of trans-disciplinarity and multispecies everything, in this moment of beginning to get a glimmer of how truly richly complex the world is and always has been, someone has the unmitigated arrogance to name it the Anthropocene. [Laughter] Tell me you share my anger! (BUBANDT et al, 2015, p. 545). Anthropologists, other researchers of humanities, as well as feminists, Amerindians and many non-scientific cosmologies have been struggling their ways for a long time for different explanations on how nature and culture are intertwined. For sure there are many ways to approach nature sciences in an effort of building knowledge that goes beyond disciplines and (and that’s a big and) the divisions between social and nature sciences. Interdisciplinarity among Social Siences is already very hard. Broader movements are not impossible but even harder. The Anthropocene is by no means the only way to make it. In fact it is a very problematic one. It is problematic as a story and as an epoch. But for us social scientists, it is more problematic as a tool. It calls for a relation between social and nature sciences which is a commensalism, a metabiosis commensalism. At the Anthropocene we are hermit-crabs, desperate for surviving, ashamed of the soft parts of our bodies – even if our bodies are not (if ever were) entirely soft. We are young hermit-crabs, anxious for our very first shell, anxious for any kind of hardness in an ecosystem in which the harder you get the better your chances of surviving. And they are the mollusks. Barely noticing we are sharing common ground (are we? ), just looking at us from time to time to yell “I” to our faces. I want to believe in creative ways of facing times of great urgencies. Ways in which we name our times after more than the ability to say “I”. Donna Haraway (2016) suggests we dig deep on terra. And let it rot. Anthropocene is not the only and definitive way to deal with our collective urgencies. As I have tried to argue in this short essay, it doesn’t seem like we can compete for the ultimate meaning of Anthropocene with Crutzen and other hard scientists. Beyond the many small risks, we are perhaps boosting up a concept that will end being Crutzen’s concept. All those amazing things the Anthropocene apparently promises are achievable without it, so it is hard to understand why we should embrace its risks. It doesn’t matter how big can the success of Latour or AURA on their journey be: if what we get from this struggle is another huge meta-tale/theory about a unique and global world “we” all share, it is already a loss (even more for those who only recently have been heard about their ways to see and relate with their worlds). The vivid late-capitalism should have taught us how dangerous it is to trust on bets if you’re not playing in the winning team. If we are thinking of ways of working together, we need to know social scientists are not the only ones putting effort into new relations. And above all, social scientists must stand for the idea that “the harder the better” is a false statement. Social scientists are not hermit-crabs. At least not regular ones. If we need indeed harder approaches to make transdisciplinary science we should take the metaphor of the hermit-crabs somewhere else. 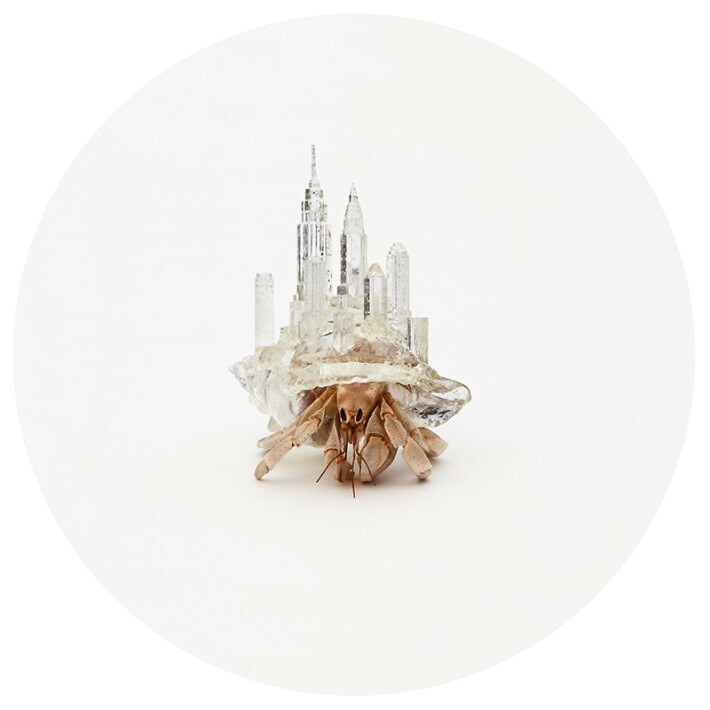 Aki Inomata is a Japanese artist who made several expositions under the name “Why Not Hand Over a ‘Shelter’ to Hermit Crabs?” (INOMATA, 2009). In general terms, her work consists in building 3D-models shells that can be used as shelter by real-life hermit-crabs. The 3D-models were tested many times along with the crabs and were built under very precise and technical expertise, which we can attest through the video that registered the building-processes, also made by the artist. I’m originally from Tokyo, so I never really knew what nature was. It was always seen from afar. I never really had a chance to experience it. And now the world has entered into the internet age where everything is online. We’re living in an artificial society, which is created by humans for humans. It’s very distant from nature. […] My motivation is not so much about experiencing nature, but what I want to do is create a mix, an amalgam of nature and artificial society (INOMATA, 2015, np, grifo meu). Inomata built shells in the form of known sites of big cities. She calls the crabs by their Japanese name, even when speaking in English: Yadokari. She does that, among other reasons, because in Japanese the word also means “someone living in a temporary dwelling” (INOMATA, 2009, np). This way she could connect a scientific narrative with nature-culture urgencies of our times, such as refugees and climate change. Picture 3 -“Why Not Hand Over a ‘Shelter’ to Hermit Crabs?” (INOMATA, 2009). Assuming we could be Yadokaris instead of regular hermit-crabs in the wild means a completely different approach to the hard shells. I think of Inomata art as a good story, the kind of story Donna Haraway (2016) calls SFs. “SF is sign for science fiction, speculative feminism, science fantasy, speculative fabulation, science fact, and also, string figures” (HARAWAY, 2016, p. 10). In Inomata’s work we can think about pre-constructed shells, based on tests that are artistic and scientific at once and demands different knowledges working together. So the shell is no longer something that simply is there, telling us we need a pre-existing hard cover for surviving. This piece of art is at once a metaphor and an experiment by itself. The Yadokari then are not the crabs itself, but the interaction between hard and soft, nature and culture, natural and artificial, construction and spontaneity, art and science, human and non-human. It is no longer only a metaphor because this rich interaction is assumed to be an interspecies product, in which humans are only a part. But what matters the most going from regular hermit-crabs to Yadokari is that we make sure that the hardness we are engaging into is in-process, ongoing building, and most importantly, that we are part of these processes. Yadoraki, then, is not a story at or about Anthropocene. It is a story of approaching transdisciplinarity despite that. Yadoraki is a SF which works as an inspiration for the idea that we don’t need Anthropocene for transdisciplinarity. BUBANDT, N. et al. Anthropologists are talking – about the Anthropocene. Ethnos, v. 81, n. 3, p. 535-564, 2015. Available at: <http://dx.doi.org/10.1080/00141844.2015.1105838>. Last visit: 14 jun. 2018. CRUTZEN, P. Geology on mankind. Nature, v. 415, 2002. CRUTZEN, P. et al. The Anthropocene: are humans now overwhelming the great forces of nature?. Ambio, v. 36, n. 8, p. 614-621, 2007. CRUTZEN, P. et al. The new world of the Anthropocene. In: Environmental Science & Technology, v. 44, n. 7, 2010. CRUTZEN, P. J.; STOERMER, E. F. The “Anthropocene”. IGPW Newsletter, n. 41, may 2000. HARAWAY, D. Staying with the Trouble: Making kin in the Cthulhucene. Duke University Press, 2016. INOMATA, A. Why not hand over a “shelter” to hermit crabs?. 2009. Available at: <http://www.aki-inomata.com/works/hermit_2009/>. Last visit: 14 jun. 2018. INOMATA, A. Artist interview: Aki Inomata. Cool Hunting, 2015. Available at: <http://www.coolhunting.com/culture/artist-interview-aki-inomata>. Last visit: 14 jun. 2018. LATOUR, B. Anthropology at the time of the Anthropocene – a personal view of what is to be studied. In: The anthropology of sustainability: Beyond Development and Progress. Palgrave Studies, 2017. LATOUR, B. Telling friends from foes at the time of the Anthropocene. In: HAMILTON, C.; BONNEUIL, C.; GEMENNE, F. (Ed.). The Anthropocene and the global environment crisis: rethinking modernity in a new epoch. London: Routledge, 2015. Available at: <http://www.bruno-latour.fr/node/535>. Last visit: 14 jun. 2018. SWANSON, H. Anthropocene as political geology: current debates over how to tell time. Science as Culture, v. 25, n. 1, p. 157-163, 2016. TSING, A. et al. Less than one but more than many: Anthropocene as science fiction and scholarship-in-the-making. Environment and society: advances in research, v. 6, p. 149-166, 2015. * A preliminar version of this essay was presented publicly at the 7o Simpósio Nacional de Ciência, Tecnologia e Sociedade, at Brasília in 2017 and a brief version in Portuguese was published by GEICT blog (available at: <https://geict.wordpress.com/2017/10/11/com-quantas-conchas-se-faz-boa-ciencia-social/>). Pictures produced by myself for this essay. Available at: <http://www.environmentandsociety.org/exhibitions/anthropocene/paul-j-crutzen-mister-anthropocene>. Last visit: 14 jun. 2018. “For me, the term Anthropocene maintains a productive distance to ‘Man’, the modern human conceit. […] It was ‘Man’ who was supposed to conquer nature. Building that recognition into the name Anthropocene could potentially […] bring some thought to the contradiction of asking for solutions from the very creature that caused all the problems in the first place” (BUBANDT, 2015, p. 541). The latin term “terra” can refer at once to many ideas which in English are different words. In Portuguese, for instance, “terra” can mean Earth, dirt, land, property, soil, etc. Available on: <https://vimeo.com/76794597>. Last visit: 14 jun. 2018. This image belongs to Inomata’s official website, and can be found at: <http://www.aki-inomata.com/works/hermit/>. Last visit: 14 jun. 2018. ABSTRACT: This essay aims to discuss the use of the concept of Anthropocene as a tool for inter or transdisciplinarity. Some well-known social scientists like Bruno Latour and the group AURA (Aarhus University Research on the Anthropocene) have shown enthusiasm with the concept as they see it as a great opportunity for hybridizing science and politics and, moreover, for social e natural sciences working together. Following the criticism made by Haraway (2016), this text thinks with hermit-crabs and suggest that the Anthropocene used as a tool is not the interdisciplinary panacea some social scientists would like it to be. It calls for a very specific relation between social and nature sciences, which is very much alike the one hermit-crabs make with mollusks: a single-handed job, barely noted by the other, in which the main task tends to be surviving in an environment extremely hostile for those with soft bodies – or sciences. Alternatively, I suggest the work of the Japanese artist Aki Inomata and the Yadokari as a different and alternative way of thinking about the relation between social and natural sciences. KEYWORDS: Anthropocene. Interdisciplinarity. Hermit-crabs. Inomata. Haraway.